Looking for the right volcano name to use in my post I found only great confusion, even in official sources. Volcán de Santa Ana is the official name given in Spanish, there’s no doubt. 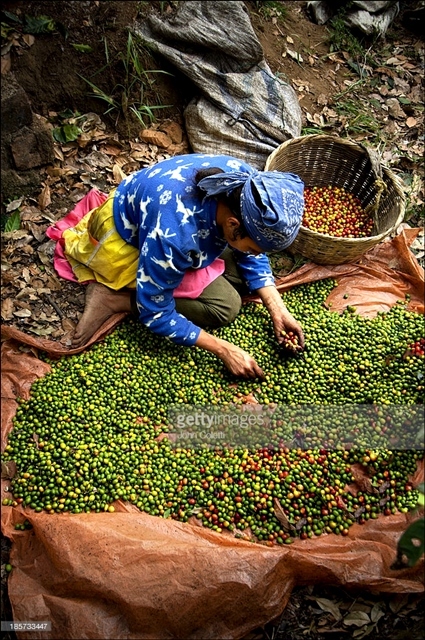 However, in articles across the web you can also find it variously called Ilamatepec, Llamatepec or Lamatepec. Faggioli (2013) notes that all those have no base in the native Náhuat language. The initial “I” in Ilametepec is someone’s invention and plain wrong. It has been called Lamatepec in the work of a 19th century researcher, and this name has since become habitually in use locally. In western El Salvador, Central America, lies the Cordillera de Apaneca-Lamatepec, or, in geological terms, the Central America arc. The Santa Ana volcanic complex is the eastern end of it. Some 40 km further east is the sprawling capital San Salvador. The city of Santa Ana lies at the foot of the northeastern slope of the volcanic complex and Sonsonate on the southwestern. 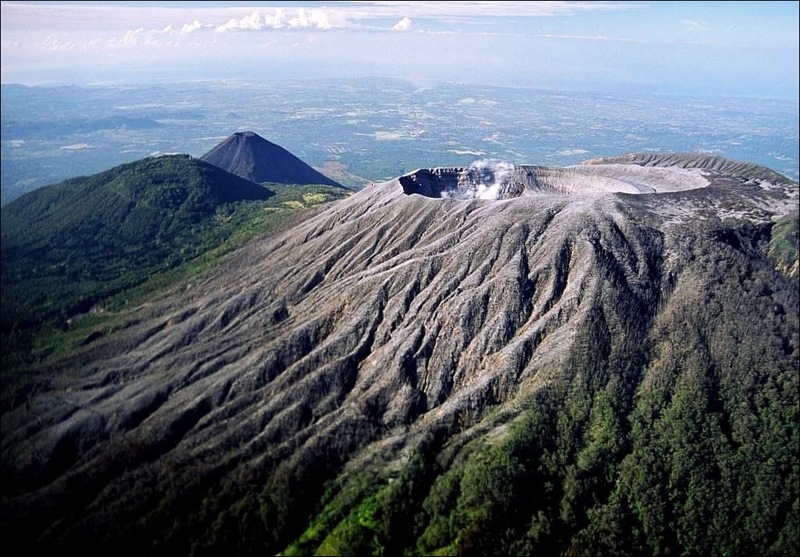 Volcán Santa Ana is part of the Parque Nacional Los Volcanes; together with its satellitic cone Cerro Verde, the volcán Izalco and Lago de Coatepeque it must be a paradise to visit – if circumstances allow. Cordillera de Apaneca-Lamatepec with Santa Ana volcano at its eastern end. 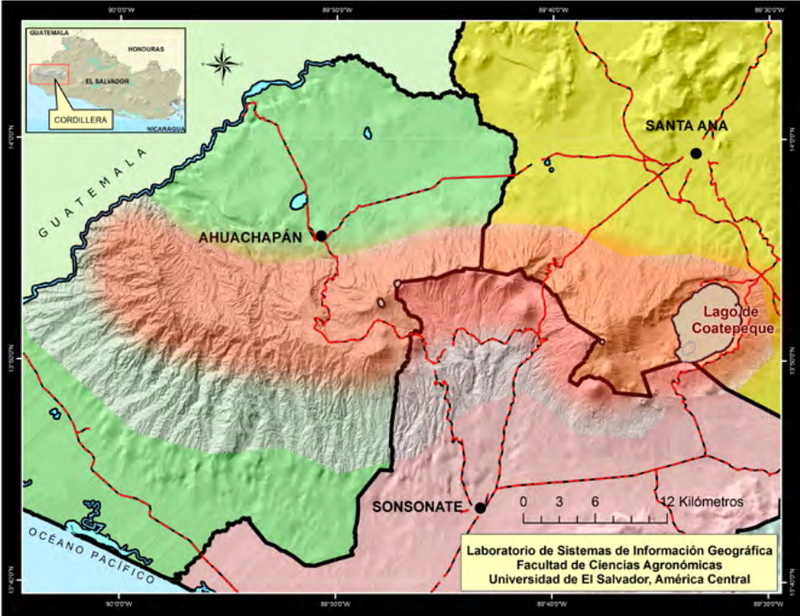 The Santa Ana volcanic complex consists of the silicic Coatepeque caldera, the andesitic‒>basaltic stratovolcanoes Santa Ana and Izalco and several satellitic mafic cones. Immediately E of volcán Santa Ana resides the Caldera De Coatepeque which partially truncates our volcano. 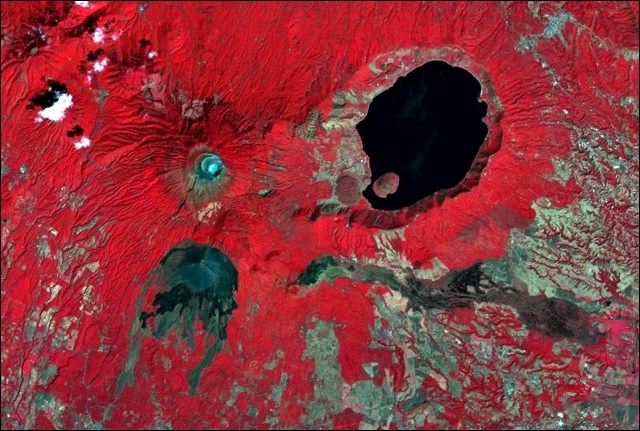 This caldera resulted from a series of explosive rhyolitic eruptions between about 72 ka and 51 ka, and eventually from the collapse of a group of stratovolcanoes. Since then, basaltic cinder cones and lava flows near the western edge of the caldera have formed, as well as six rhyodacitic lava domes. The youngest, Cerro Pacho, is less than 10 k years old. Also, several fumaroles and hot springs near the lake’s shores are signs of a still active hydrothermal system. Pumice fall and pyroclastic flow deposits (Arce eruption) from this caldera are distributed over much of western El Salvador. They account for a volume of ~56 km³ – that’s no amount to be sneezed at! In nearly all photos by tourists visiting volcán Santa Ana a steep, near perfect volcanic cone features almost more prominent than Santa Ana itself. Volcán de Izalco, El Salvador’s youngest volcano, was born as a parasitic cone in 1770 on the southern flank of Santa Ana. Frequent strombolian eruptions from Izalco provided a night-time beacon for ships, causing the volcano to be known as El Faro, the “Lighthouse of the Pacific.” During two centuries up to 1966 Izalco grew 650 m high, becoming a stratovolcano in its own right. Volcán Santa Ana is with 2,381 m the highest in this country. It has four identifiable craters on its summit that cut the main crater. The present crater is about 1.5 km in diameter and 350 m deep. Santa Ana’s magmatic system is a large central vent with a series of parasitic vents and cones around it. Those have formed along a 20-km-long fissure system that extends from near the town of Chalchuapa NNW of the volcano to the cinder cones on the SE flank. One of these, the San Marcelino cinder cone, produced a lava flow in 1722 that traveled 13 km to the E.
The complex of Santa Ana volcano. Its small light-bluish crater lake is visible at the left-center in this false color NASA ASTER image (N to the top) from 2001. 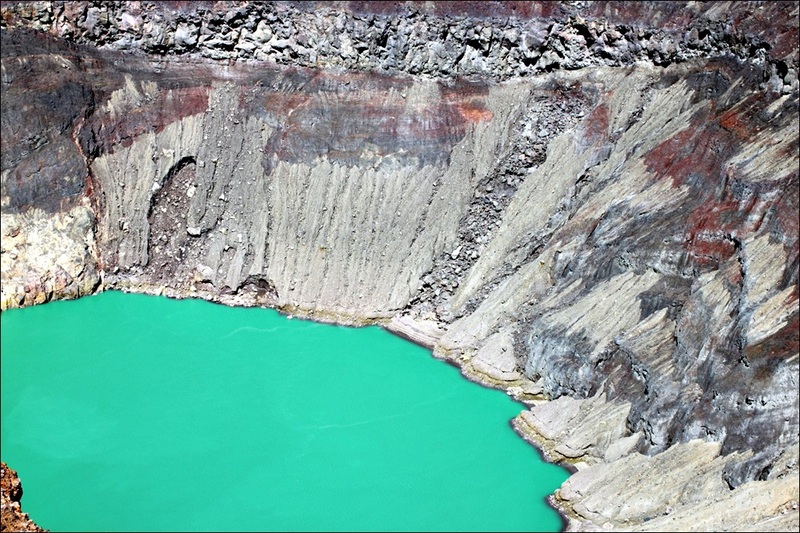 The lake-filled Coatepeque caldera cuts the eastern side of the Santa Ana massif, and Izalco volcano and its historical lava flows lie south of Santa Ana. A NW-SE-trending fissure cutting across the massif was the source of an eruption in 1722 from the San Marcelino cinder cone (center). It is visible on the SE flank and fed the lava flow extending across the image to the lower right. Courtesy of NASA’s Earth Observatory. 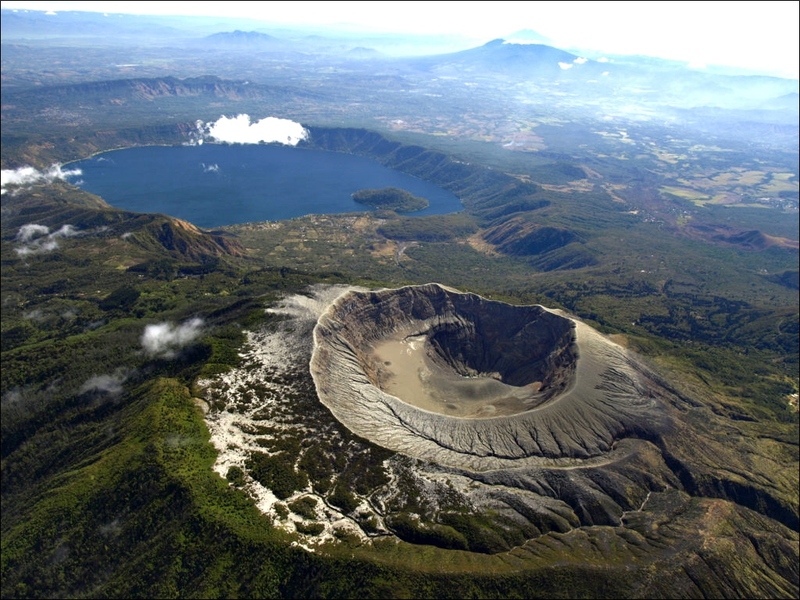 This volcanic complex has had more continuous eruptive activity in historic time than any other area in Central America. The eruptions of the last few thousand years were mostly phreatic or phreatomagmatic at the central summit vent, suggesting that a large and permanent hydrothermal system exists beneath the volcano. The collapse of the volcano during the late Pleistocene produced a humongous debris avalanche that swept into the Pacific Ocean, 40 km away. There it created the Acajutla Peninsula jutting out some 6 km into the sea. 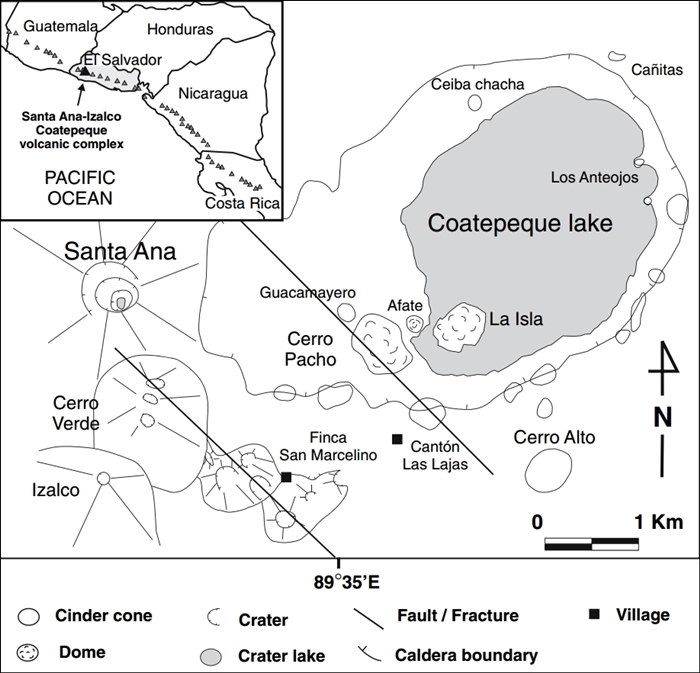 According to GVP, Santa Ana volcano was very active during the 16th c. with at least three VEI 3 eruptions. Later confirmed eruptions were: eight in the 18th-20th c. and in 2005. 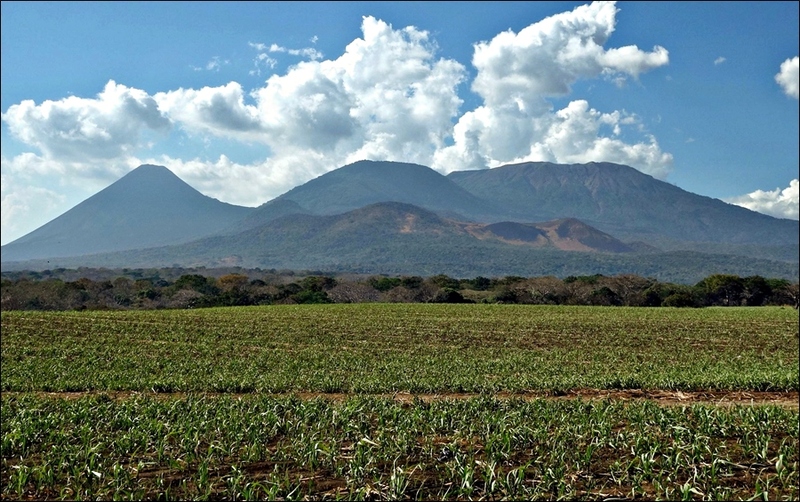 Faggioli (2013) additionally mentions an eruption of Santa Ana in 1937 – synchronously with its close neighbor volcán Izalco. Historic eruptions have been mostly small-to-moderate and explosive, from both summit and flank vents. The crater is often filled by permanent steamy gas clouds that emanate from a number of fumaroles in the western part of the interior. At the bottom of the crater a lake has partly filled a hole of 500 m which was ripped open by an explosion in the 1904 eruption. This lake has a typical acid-sulfate-chloride composition with a pH of less than 1.0. It is max. 27 m deep. It was mentioned that the eruption before the last, in 1904, had been a “major” one with lava flows. Other mentions called it “a small eruption”. I have tried to find some details on that, but with no success. As it didn’t show much activity in historic times, the volcanic complex has been developed as a tourist center and agricultural area. 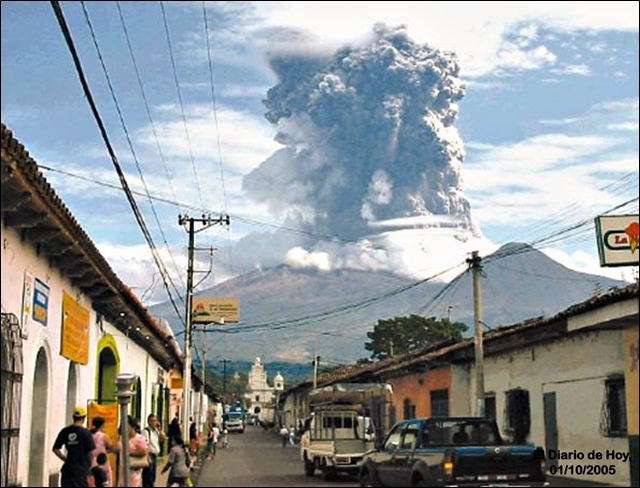 However, in previous years, and particularly following an M 7.6 earthquake in January 2001, residents complained of increased acidity of the volcano’s plume and were concerned about a volcanic crisis. 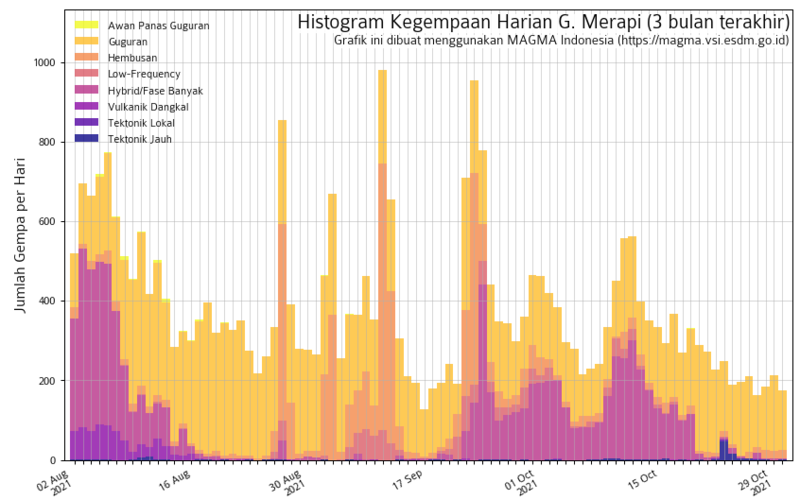 In the months before the eruption on 1 Oct. 2005, a steady change in behaviour patterns of the volcano had been observed. A small phreatic explosion may have taken place already in June. On Aug. 10 the first anomalies were mentioned in the reports: A slight increase in seismicity, landslides in the crater and a significant increase in gas emissions; the latter with “a sound similar to that of a jet plane turbine inside the crater”. At the end of August the entire hydrothermal field of 200m² was reportedly aglow – an effect of hot gases heating up the rocks. Also, SO2 emissions were up, towards end of Sept. they reached a max. 4000 t/day. 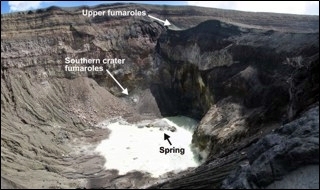 Several days before the eruption, a significant further increase in the extent and intensity of the fumarolic field inside the crater and of the lake temperature was observed. And yet, reports state that the eruption on Oct. 1 came unexpected. It was phreatic and sent an ash plume to an altitude of 10km (NASA: 14 km). Ash was falling to the W, and ballistic blocks up to 1m in diameter made impact craters S of the volcano as far as ~2 km(!) from the summit. a debris flow went down a quebrada (ravine) in the SE of the volcano. Several thousand residents were evacuated. 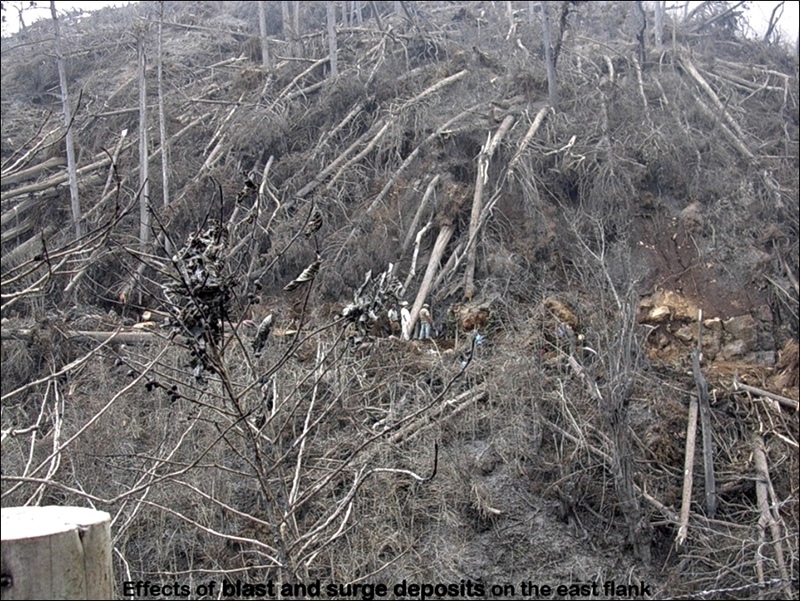 As if that wasn’t enough, the tropical storm “Stan” ravaged the area from 1-10 October 2005 and made everything doubly difficult and dangerous – the evacuation of residents as well as the monitoring of the eruption. Lahars descended later in the storm and persisted well into 2006, when SNET had registered 22 of them. It is interesting to note that, in the hours before the eruption, there had been no particular changes in the seismic activity of the volcano. In the opposite, seismicity had shown a tendency to decrease. 11 hours after the eruption, seismicity was back to background levels. Surprisingly, during an aerial inspection on 11 October, no important changes were observed at the crater. The lake level was similar to before, but the water had turned from a dark coffee color to bright turquoise. Hot spring emerging in the acid lake at Santa Ana as seen 5 July 2007. 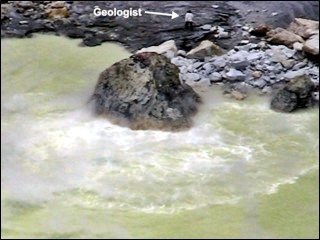 Episodic upwelling of whitish fluid radiated out from the base of the large rock in the center of the photo; note geologist for scale. ©Matt Patrick. Bubbling could be seen in the center of the lagoon, but in some moments (coinciding with rises in seismicity) the entire lake surface has been roiling and steaming. 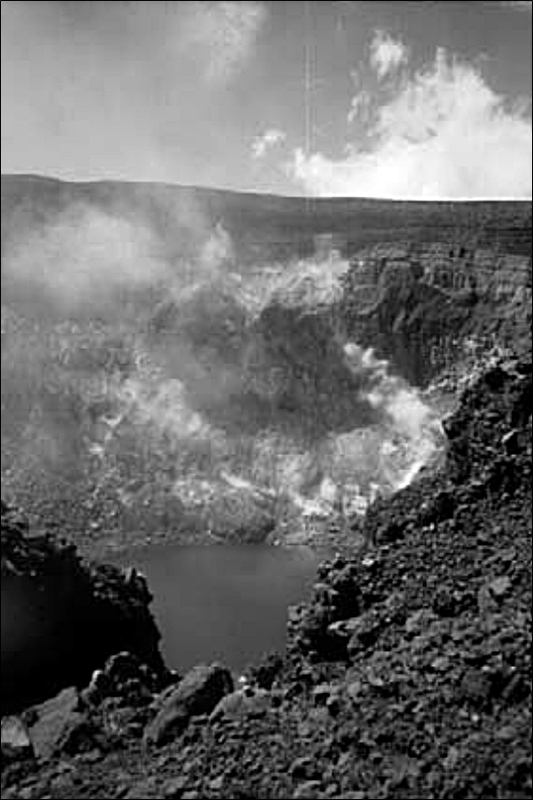 The volcano remained restless until well into 2006, with relatively high SO2 emission rates, seismicity above background levels, and strong evaporation of the summit crater lake. As there was no evidence of fresh lava the explosion must have been fed by a shallow, strongly degassing magma body. Its closeness to the surface was responsible for the high measured temperatures. Possibly, water that drained into heated cracks had served as the trigger of the eruption. Although, from the descriptions, it seems to have been a quite small eruption, it did get classed as a VEI 3 after all. Before Santa Ana’s last eruption the crater lake had an average surface temperature of 18–20°C, which is quite cold for a crater lake. In 2017 it was at 50-60°C. SNET is monitoring and – sometimes – publishes a report. The last one is from 06/2017. IS THERE A RISK IN VISITING THE VOLCANO? Approximately 10,000 people live in the direct surroundings of the volcano. However, with the two major cities within 20 km of the volcano it represents a significant threat for one million people should Santa Ana erupt in grand fashion. 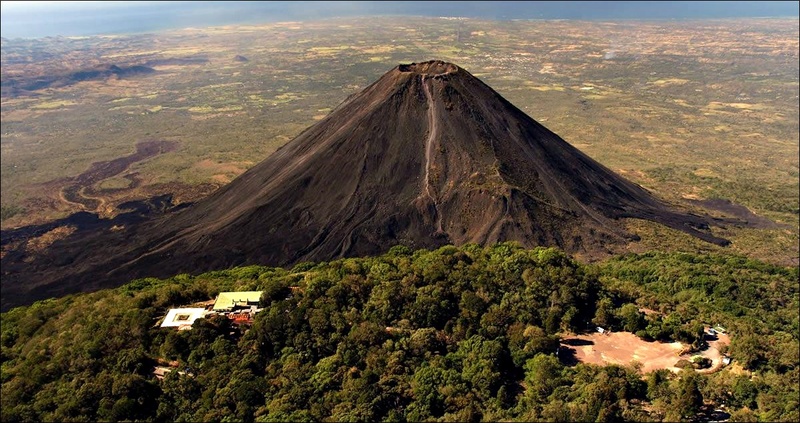 El Salvador has had far less historic volcanic activity than, say, Guatemala; but it may be even more vulnerable to volcanic hazards because the country’s infrastructure is located almost completely on or near volcanoes. Because the historic time period has been unusually quiet, people are not very aware of potential hazards. It’s rather the problems of civil war, earthquakes, landslides, and hurricanes that are at the forefront of Salvadoran’s memories. Although the slopes of volcán Santa Ana had been widely denuded by acidic gases, ash fall, torrential rains and lahars after the 2005 eruption, vegetation seems to have well recovered by now. 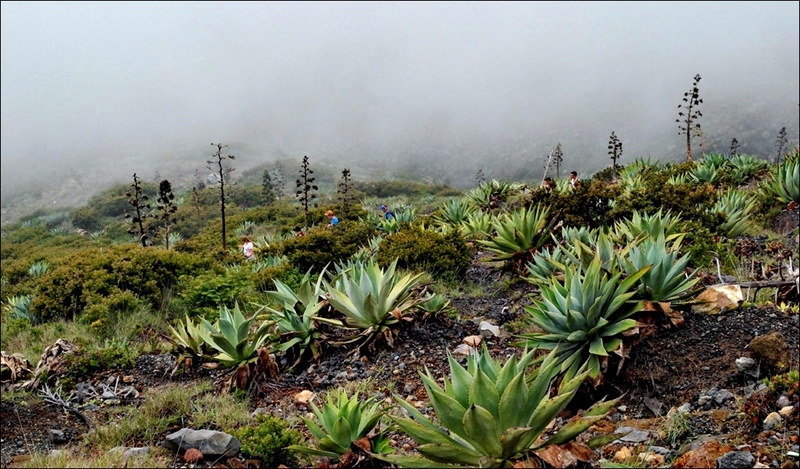 The volcanic complex is the largest protected area in the UNESCO designated Apaneca-Lamatepec Biosphere Reserve. It boasts a variety of ecosystems and habitats. So, people have busily organised guided tours to the crater and other facilities for tourists to spend time in the park and on the volcano. 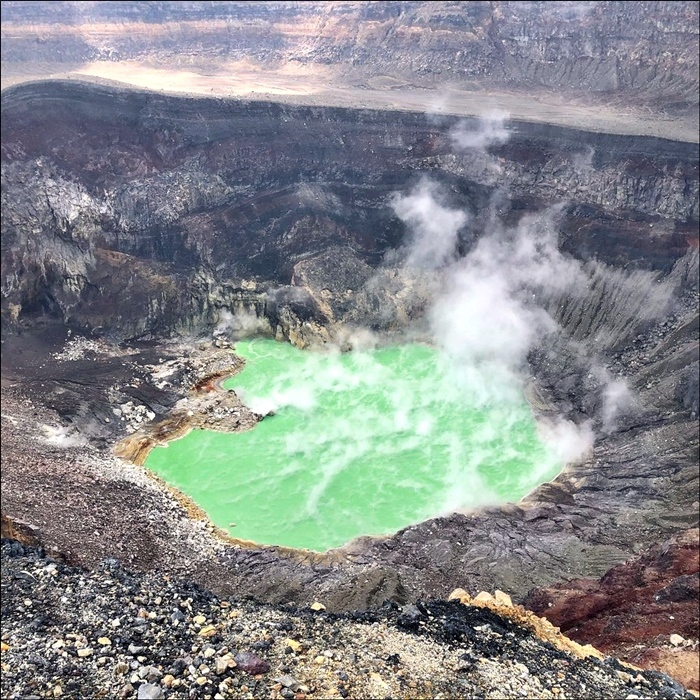 Even though many visitors complain about the acrid smell and sometimes breathing difficulties near the crater, it is a “must see” destination in El Salvador. I can’t say I blame anyone – I’d probably go myself. But the gut feeling is… well, I don’t know. Many international research projects and improvements in monitoring have been implemented since the last eruption. Yet, regular reports on present situation are few and far between to find online. Perhaps it’s all communicated by word of mouth? I sincerely would recommend anyone who plans a visit to Santa Ana volcano to thoroughly read up – on the volcano, on the risks, on communication problems to the public, on the general circumstances – and then make an informed decision. 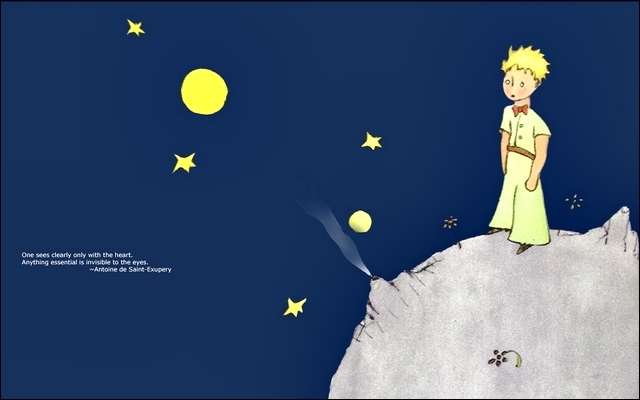 A last tidbit of trivia: Allegedly, Lamatepec was the inspiration for one of the active volcanoes in Antoine de Saint-Exupéry’s famous French novella “The Little Prince”, based on his life with his Salvadoran wife Consuelo de Saint Exupéry, who was The Rose in the story. A long read ! many things to ponder upon. People near there must be sooo sick of the ever repeating wobbles… ad nauseam. Funnily, one translation in German for ‘ad nauseam’ is ‘bis ins Aschgraue”, literally ‘up into the ash-gray’. I guess the feeder underneath is still the same straight up magma column. Will be interesting to see it again when the pattern changes. Perhaps the dike will be seeking a different outlet when all the debris from above has blocked the original vent. Apart from the center, it seems there are more (and stronger) EQs occurring to the SE of the crater than elswhere around it. Wonder if that has any meaning as to where the magma will go in the future? I’ve just read the abstract so far; interesting, that basaltic volcanoes with frequent eruptions are the most difficult to forecast and alert in good time. 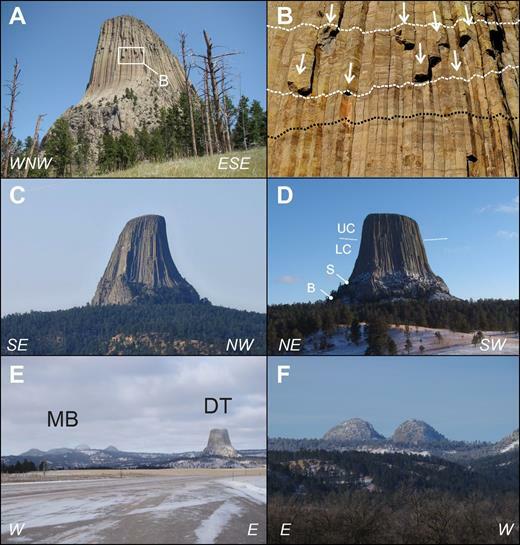 Devils Tower (Wyoming, USA): A lava coulée emplaced into a maar-diatreme volcano?